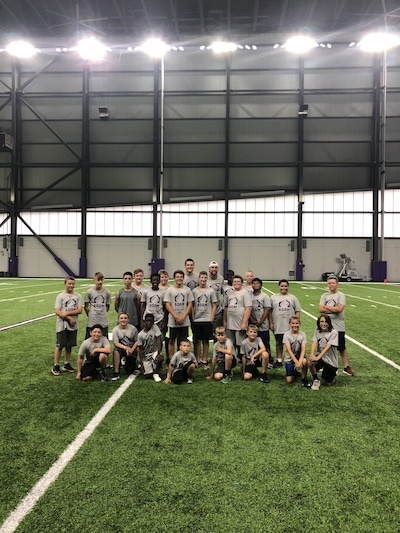 Thanks to everyone who came out to make our first Adam Thielen Youth Football Camp a success! Over 250 kids ages 6-16 took the field on June 24 at TCO Performance Center where we ran one-on-one drills and worked in groups to emphasize the level of effort and commitment needed to make daily improvements in sport and in life – pay attention to the little details, make every rep count, and improve every single day. By hosting this football camp, my biggest goal is to show kids that no matter your life goals, you have to be committed to taking advantage of every opportunity to get better. It’s more than just learning how to throw a football, it’s the underlying mentality of daily improvement that I hope these kids continue to adopt no matter where life takes them. 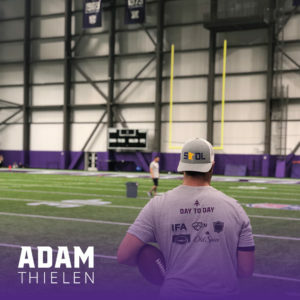 What’s more, Cait and I are excited that proceeds from this camp will be put toward the newly created Thielen Foundation, an organization we recently launched to help support at-risk youth throughout the Minnesota community. Underscoring this mission of youth development, we are close to finalizing our partnering organizations that we’ll be working with during the foundation’s founding years. Stay tuned on our announcement coming soon, we can’t wait to share these details once everything is locked in. Last but certainly not least, can’t forget to give a huge shout out to our amazing sponsors who helped bring this camp to life! Huge thank you to Hormel Foods, Jennie-O Turkey, Old Spice, Everett Sports Marketing, the Institute for Athletes, the Minnesota Vikings and ETS Elite Next Level. Couldn’t do it without you guys!